With nearly 40% of HootSuite’s over 3 million daily messages being sent through Facebook, HootSuite has added a string of new features to enhance the control and monitoring powers. A total of six new or enhanced features, available immediately to HootSuite users, have increased the demographic targeting and messaging capabilities of team members on Facebook, expanded the available analytics, and have made it possible to search Facebook from within the dashboard, among other functions. HootSuite has quickly become the leading social media management tool for enterprise and is used today by leading brands such as PepsiCo, McDonalds, Virgin and more. Enhanced Demographic Targeting: Enterprise clients can now target Facebook users by Age, Gender, Interested In, Relationship Status, and Education. Geo-Fencing Profiles: Profile settings to Geo-Fence profiles. Create profiles for team members to limit the target audience of their posts by language and location for enhanced control and targeted messaging. Private Messages: Respond to follower fan private messages sent to Facebook pages, then track them easily. 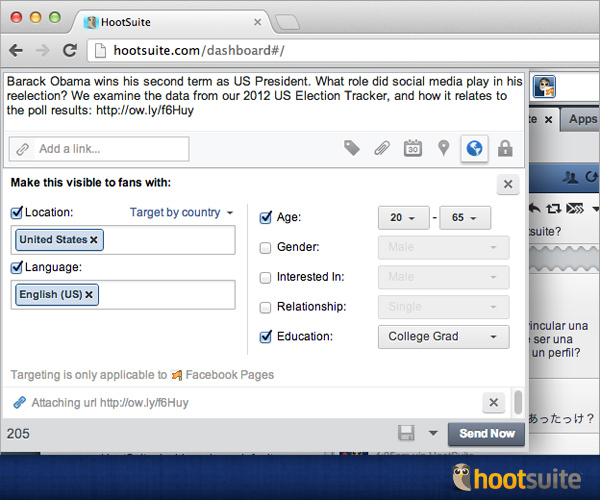 Expand private conversations within HootSuite streams to view the full thread. Facebook Search: Users can now search Facebook from the HootSuite dashboard. Facebook Stream real-time Likes and comments: Real-time monitoring of Likes and comments within the HootSuite dashboard. Event Streams: Create a stream of group events on HootSuite. Argentina’s Avatar Agency, which controls the South American Facebook accounts of Audi, ESPN, Coca-Cola and a number of other select clients, has been using HootSuite’s new Demographic Targeting and Geo-Fencing features to great success. HootSuite had also added five new Facebook Analytics Module that will allow Pro users and Enterprise clients to track their reach and see who is talking about them by region and by demographic. It also allows users to compare public pages by tracking Likes and those “talking about” them and then comparing these figures to companies of their choice. HootSuite’s advanced Facebook functionality makes utilizing the leading social media network a simple process for any team members. Customizing, uploading, searching, and measuring on Facebook just got a massive upgrade from HootSuite. This entry was posted on Tuesday, November 13th, 2012 at 7:19 am and is filed under Digital Products, National News, New Releases, Social Media, Software. You can follow any responses to this entry through the RSS 2.0 feed. You can leave a response, or trackback from your own site.